Buy my ebook "Our Experience with House Cows" on Etsy, Lulu and Amazon, or email on eight.acres.liz at gmail.com to arrange delivery. 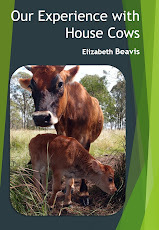 More information on my house cow ebook blog. This July Pete and I have taken up the challenge once again to reduce and analyse our single use plastic consumption with Plastic Free July. Throughout July have to shared with you our progress, and lots of tips and ideas, and its been great to see you all join in. I have one more giveaway, so join in, share your ideas and have a chance to win some plastic-free products this July! Cooking chokos (not be confused with another post about cooking chooks) has been the subject of a few questions on my blog lately, so here's some more information for you. Chokos - also known as Chayote, christophene or christophine, cho-cho, mirliton or merleton, chuchu, Cidra, Guatila, Centinarja, Pipinola, pear squash, vegetable pear, chouchoute, güisquil, Labu Siam, Ishkus or Chowchow, Pataste, Tayota, Sayote - is a vine belonging to the Cucurbitaceae family, along with pumpkins, squash and melons, with the botanical name Sechium edule. For a while now I have believed that the main barrier to me doing a better job of sewing my own clothes was my lack of a or dressmaker's dummy (aka dressmakers form or mannequin). When I last investigated the cost of a dummy, they seemed too extravagant, so I looked for a way to make my own. There are a few methods around, using plaster bandages, using paper packaging tape, and finally, the one I chose, duct tape! This July Pete and I are taking up the challenge once again to reduce and analyse our single use plastic consumption with Plastic Free July. What's plastic-free in my bathroom? We usually keep around ten to twenty hens for eggs. Unfortunately, as hens get older, they lay less frequently, and that's an awful lot of hens to feed if they are not producing eggs. Every year we cull the older hens, but they don't go to waste. If any are really skinny or unwell, we bury them in the garden, but the rest of them we butcher and cook. Sure old hens can't be cooked the same as a young rooster, but you can still prepare some delicious meals from them. We don't buy chicken meat, so any opportunity to eat chicken is a rare treat for us and we don't waste anything! Roast hen - you can roast the hens, but they need to cook for a long time, several hours, in a closed roasting dish with liquid in the bottom so they don't dry out. I season with herbs and garlic. Minced hen - we also like to mince the breast and leg meat and make meatballs, this avoids the stringy texture. I bought a tiny little soapwort plant a couple of years ago and I have been waiting patiently for it to grow because I really wanted to try using it for laundry detergent. 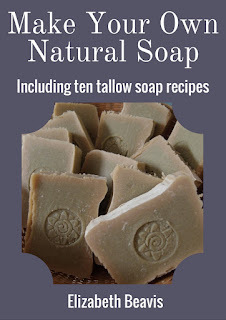 I found out about soapwort after I started using soap nuts for laundry. I like soap nuts, but they are imported from overseas and can't be grown here as they are considered a weed plant.